Nye, Naomi Shihab. 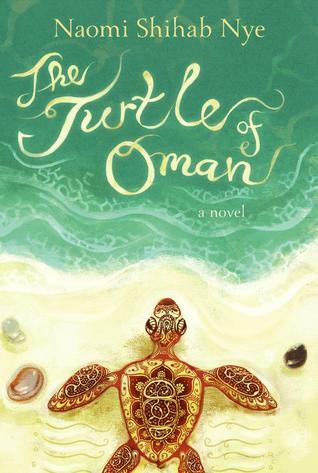 The Turtle of Oman. Aref’s father is a scientist, and his mother is a professor of English. Since the two are going to study at the University of Michigan in Ann Arbor, the family will be moving there. Aref knows that it will be a big adventure, but the week between saying goodbye to his father at the airport and the day that he and his mother leave is a difficult one. He must say goodbye to neighbors, his best friend, his grandfather, and he must pack one suitcase to take with him. During his preparations, he visits different places in his neighborhood, including a neighbor who is 100 years old and will be 103 when he returns, and spends a couple of days with his grandfather fishing while his mother takes care of loose ends in Muscat. At the end of the week, Aref has finally packed and is ready to set off for the United States. Strengths: Nye is a wonderful writer (I’m a huge fan of her poems), and she does a good job of capturing not only Aref’s emotions about moving but of describing his environment in Muscat in a way that underlines those emotions. This would be a good choice to read to a child who was moving—surely, most moves within a country are not nearly as difficult as moving into an entirely new culture. Weaknesses: I would have like to see Aref make the trip to the US and experience life in Michigan. It was interesting to find out about life in Oman, but it also would have been intriguing to see what Aref thought of life in the US.